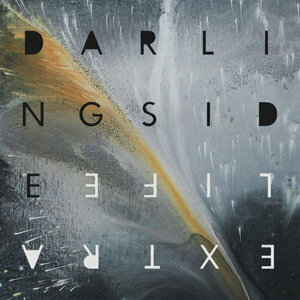 With this surprising and beautiful songwriting turn into apocalyptic metaphor, Darlingside fashion an early record-of-the-year contender. Darlingside first gained broad notice with 2015's Birds Say. On that album, bassist Dave Senft, guitarist/banjoist Don Mitchell, violinist/mandolinist Auyon Mukharji, and cellist/guitarist Harris Paseltiner fused glorious vocal harmonies that evoked classic Beach Boys and Crosby, Still & Nash to a collection of songs that evoked a sometimes melancholy nostalgia. Follow up Extralife finds the band facing forward to address the troubled present and uncertainties of future via a unique impressionistic twist: they take the staid simile of life as a video game and ramp it full of apocalyptic anxiety to create something utterly fresh and revelatory. Starting with the silly existentialism of Mario trapped in his own game, the concept of an "extra life" becomes irradiated with potential as the album progresses to reveal the darkness beneath the beauty of the band's combined voices." It's over now," they sing in the album opener, "The world has flattened down." Envisioning a multi-leveled existence modeled upon a Mario Brothers or Donkey Kong world, God becomes the "Super conductor up in the sky" rewarding "Extralife". It's a surprisingly effective metaphor, these "Push-on clouds" that "reset the sky", since eschatological apocalypse is not simply an ending; rather, it is a global cleansing so that the world may be reborn again anew. Apocalyptic images dominate the album's lyrics.We wait for the end like dinosaurs watching the meteor's approach in "Singularity": "Someday a shooting star is gonna shoot me down / Burn these high rises back into a ghost town." In the beautiful, poetically framed "Hold Your Head Up High", life is but a "let-go-of balloon". Meanwhile "Bikini snow (a 1950's-era euphemism for fallout from atomic bomb testing) burns like acetylene under our feet" as "Our future moment disappears" in "Futures" and, in a nod to Yeats' "Second Coming" with its "rough beast slouching towards Bethlehem to be born", we hear that "Something is waking on 'Indian Orchard Road'." But, as with any truly apocalyptic vision, all the uncertainty, all the fear, all of the as-yet-to-come suffering is in the service of rebirth: prophecy of not just an end but a new beginning to follow. Even as we're told of our disappearing "Futures", we are reassured by a chorus of "it's not ever too late." "Eschaton" amplifies the video game metaphor with its electronic chirps and pulses, yet offers the millennial reassurance that "No matter what we've been / We are the upshot now." Heavenly visions of Lindisfarne follow accompanied by equally angelic voices. Finally, we are reassured that "We are a long way from the best of the best of times", a central component of any apocalyptic prophecy, the promise of a rapturous rebirth or bounty following a period of tribulation. Mukharji describes the inspiration of the new album's title and theme as "a life beyond where we are now, whether that's a brand new thing, a rebirth, or just a new version of ourselves as we move forward." Extralife is a record infused with apocalyptic dread, a collection of campfire sing-alongs for the end of days. As well, it's an oddly beautiful record, comfortable in its unsettling contemplations and rapturous.